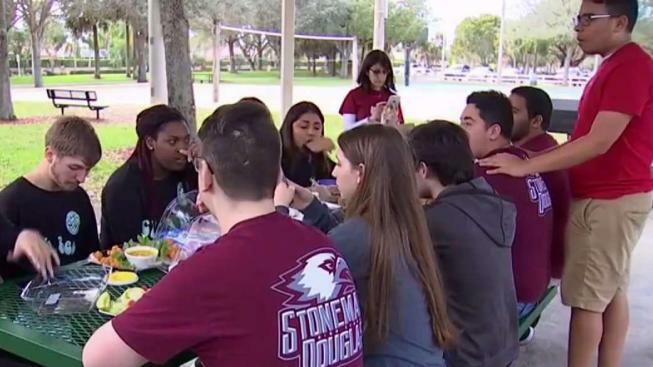 Students at Marjory Stoneman Douglas High School spent the year mark since the tragedy with remembrance and community service. NBC 6's Ari Odzer reports. Hundreds of thousands of students and adults across Florida and beyond bowed their heads in a moment of silence Thursday to mark the first anniversary of the shooting rampage at Marjory Stoneman Douglas High School in Parkland that left 17 people dead. Reporters were not allowed inside the school, but students were working on service projects, and grief counselors and therapy dogs were made available. Students could also receive massages and pedicures. Broward Schools are also sponsoring a day of service at a park in Parkland. More than 1,000 people gathered at Parkland's Pine Trails Park for an interfaith service that opened with a video highlighting dozens of service projects launched in honor of the victims, including plantings at a beach to halt erosion, a campaign to help abandoned animals and the remodeling of a dance studio. A vigil will be held later in the evening. At MSD Thursday morning, many students arrived on campus wearing headphones and the burgundy #MSDStrong t-shirts that have become an emblem of the tragedy. Outside the Parkland school, angel stakes for each of the 17 victims border the school's landscaped sign. Fourteen-year-old freshman Nathan Habte said he wanted to attend school Thursday to show support and participate in activities. Broward Schools Superintendent Robert Runcie held a breakfast for first responders at the school Thursday morning. He said while the anniversary is an "enormously challenging" time for the survivors, the victims’ families and for the community, it will be a day of "service and love" to honor the victims and to "continue working through the process of healing." "The impact of this horrific event has been monumental in its scope and its reach across this county, this state and throughout this nation," Runcie said at a news conference outside the school. President Donald Trump said in a statement Thursday that he and first lady Melania Trump are praying for those affected by the shooting. The president also noted after the tragedy he created the Federal Commission on School Safety and signed legilsation authorizing $1 billion for prevention programs and reporting systems nationwide. While many will mark the occasion, some of the relatives of the victims said it's just another day. "The anniversary for me is really meaningless because every day for me is Feb. 14," Andrew Pollack, whose daughter Meadow Pollack, 18, was killed, told NBC News. "I feel the same way every day about losing my daughter." The impact of the shooting continues to this day and it has forever changed the community. In the wake of the tragedy, students, parents, officials and others were pushed into the national limelight as everything from school security to gun violence and mental health was brought into question. It also sparked a movement among a younger generation angered by gun violence and set the stage for a significant shift in America's gun politics. Thousands of student protesters took to the streets and inspired hashtags such as #NeverAgain and #Enough. On March 24, the massive March for Our Lives was held in Washington D.C. and in cities throughout the country, as demonstrators pushed for stronger gun control legislation. The student activists also mobilized to register a new generation of voters. Candidates were emboldened too. Many of them confronted the issue in last year's elections and were rewarded with victory over incumbents supported by the National Rifle Association. That helped Democrats take back control of the House. At the federal level, for the first time in modern history, gun-control groups outspent the powerful NRA on the 2018 midterm elections. The new Democratic majority in the House this month held its first hearing on gun control in a decade. In Florida, a state that has long welcomed guns and has a strong NRA presence, lawmakers raised the gun-purchasing age and imposed a three-day waiting period. NRA spokeswoman Jennifer Baker questioned whether the influence of gun-rights advocates has waned, noting that Florida elected a governor, Ron DeSantis, who was backed by the NRA, and a majority of the organization's legislative candidates won last year. Just days after he was sworn into office, DeSantis left his own mark on the MSD shooting, suspending Broward County Sheriff Scott Israel, saying he "repeatedly failed and has demonstrated a pattern of poor leadership." Before the shooting, Israel had changed his department's policy to say deputies "may" confront shooters from "shall." Critics say that gave eight deputies an excuse for not confronting the gunman when they arrived during the shooting but stayed outside. Israel's attorneys say he intends to challenge the suspension. He intends to run again next year. All of the hard work done in the past year by students, parents and siblings has been to honor the memory of the lives lost, whether young kids who were never able to fulfill their potential or staff members who died as heroes while trying to protect students. Student survivors and activists Emma Gonzalez, David Hogg, Cameron Kasky and others became household names after founding Never Again MSD, a gun control advocacy group. MSD student Kyle Kashuv became the most prominent conservative voice among the students, meeting with President Donald Trump and advocating for teachers and school staff to be armed. Among the parents, Pollack became the most outspoken critic of school and law enforcement officials and a force in Florida conservative politics. He has also met with Trump and was on Gov. DeSantis' transition team. He has pushed for the removal of Broward school Superintendent Robert Runcie and is suing suspect Nikolas Cruz, the Broward school district and sheriff's office and former Broward sheriff's Deputy Scot Peterson, who was on duty at the school during the shooting but did not enter the building to confront the shooter. Fred Guttenberg, whose 14-year-old daughter Jaime was killed, has become an outspoken advocate for gun control and liberal causes. He drew national attention when he approached new Supreme Court Justice Brett Kavanaugh during his confirmation hearing and extended his hand, only to have Kavanaugh walk away. Max Schacter, whose 14-year-old son Alex died, became the emotional voice of the parents as a member of the state commission and founder of the group, "Safe Schools for Alex." He has traveled extensively looking at school security systems. Manuel Oliver, whose 17-year-old son Joaquin "Guac" Oliver died, is an artist who has created projects honoring his son and condemning gun violence. Tony Montalto, whose 14-year-old daughter Gina was killed, is president of "Stand with Parkland," a group of parents and spouses of the victims. The group has pushed for enhanced school security measures, better mental health screening programs and universal background checks for gun purchases. Two parents, Ryan Petty and Lori Alhadeff, ran for school board seats in 2018. Alhadeff, whose 14-year-old daughter Alyssa was killed, won, while Petty, whose 14-year-old daughter Alaina died, lost his bid. "For me, it's honestly still 2/14/18," says Alhadeff. "It's not really set in that this is a reality for me. I feel that Alyssa is still coming home. She's at her soccer game and she's still going to walk through this door." 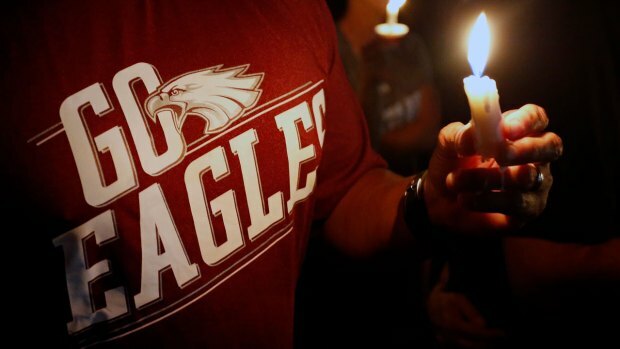 The other students killed in the shooting were 17-year-old Nicholas Dworet, who had committed to swim for the University of Indianapolis; Peter Wang, a 15-year-old ROTC student at MSD; 15-year-old Luke Hoyer, who was known for his love of basketball; 14-year-old Martin Duque, who was also a cadet in the ROTC program; Carmen Schentrup, 16, who had been named one of 53 National Merit Scholarship Program semifinalists in the county months before the shooting; 14-year-old Cara Loughran, who was an excellent student who loved the beach and her cousins, according to her family; and 17-year-old Helena Ramsay, who family members said was soft-spoken but also smart and a go-getter. The three staff members killed in the shooting will also be remembered on Thursday. Assistant football coach Aaron Feis was shot to death while selflessly shielding students from bullets. Feis graduated from the school in 1999 and worked mainly with the junior varsity. He lived in nearby Coral Springs with his wife and daughter. Chris Hixon, athletic director and wrestling coach at Stoneman Douglas, died while patrolling the campus and monitoring threats as a security specialist at the high school. Scott Beigel was a geography teacher who died protecting students during the mass shooting. Students said he helped them enter a locked classroom to avoid the gunman and paid for the brave act with his life. Meanwhile, the criminal case against the 20-year-old suspect in the shooting, former MSD student Nikolas Cruz, is moving slowly and could take years. No trial date has been set, even as prosecutors have pushed to start this year. Cruz's lawyers have repeatedly said he will plead guilty to 17 counts of murder and 17 counts of attempted murder in return for a life prison sentence, but Broward County prosecutors want his guilt and ultimate fate decided by a local jury. They are seeking the death penalty.